I’ve been contacted by many who have shared great insights on the sports and athletes mentioned here at StubbyCurrence.com. I was lucky to hear from Josh Hall, whose dad is Don Hall, a 1955 Logan Wildcats center named to that year’s West Virginia High School Basketball All-State Team by a selection board overseen by Stubby Currence. Oh, I would have loved to ask Stubby why! If a basketball enthusiast was to select one year to chronicle out of nearly a century of West Virginia High School basketball, they could find few more interesting and historic than the 1954-1955 season. The basketball world in 1955 looked somewhat different than it does today partially due to slow integration. Major League Baseball was integrated in 1947. The NBA (which consisted of only eight teams) was integrated in 1950. In the West Virginia High School ranks, there would be two more seasons after 1955 before complete integration. Bill Lewis of Grafton High School, however, became the first black player in the history of the West Virginia High School Basketball State Tournament in 1955. The way the game was being played was changing too. This was the era of crew cuts, Chuck Taylor All-Stars, narrow foul lanes, and players who were still referred to as “cagers”, but the mid-50’s marked a transition to the modern game. Two hand set shots were becoming modern jump shots. The fast break was the weapon of choice for many teams. Games were often played at a frenzied pace before packed and in many cases, rowdy gymnasiums. Three of the state’s top teams; Mullens, Wheeling, and Huntington High Schools, averaged nearly 90 points per game. In 1955, single game team scoring records were set three times in a one-month span. One constant, however, has been the source of pride that high school sports teams have been to communities throughout West Virginia and in the 1950’s, the toughness of their basketball teams often reflected a town’s identity. “Coal Camp” towns produced lean, hard-nosed, gritty players. One such team, the 1955 Logan Wildcats, went 22-3 with wins over both 1955 state finalists. The season included most of the players that would make up the roster of West Virginia University’s 1959 NCAA Finals team. A 146 to 110 contest between Wheeling and Weirton…still the highest scoring game in West Virginia High School basketball history. At least seven different players had 50 points in a game. The undefeated regular seasons of Class “A” schools, Gauley Bridge and Clarksburg-Washington Irving and the Class “B” school, Gassaway. Charleston-Garnet defeated Beckley-Stratton to win the W.Va. Athletic Union Championship. Fairview beat Chattaroy to win the Class “B” state championship. Mullens defeated Huntington to win the Class “A” state championship. 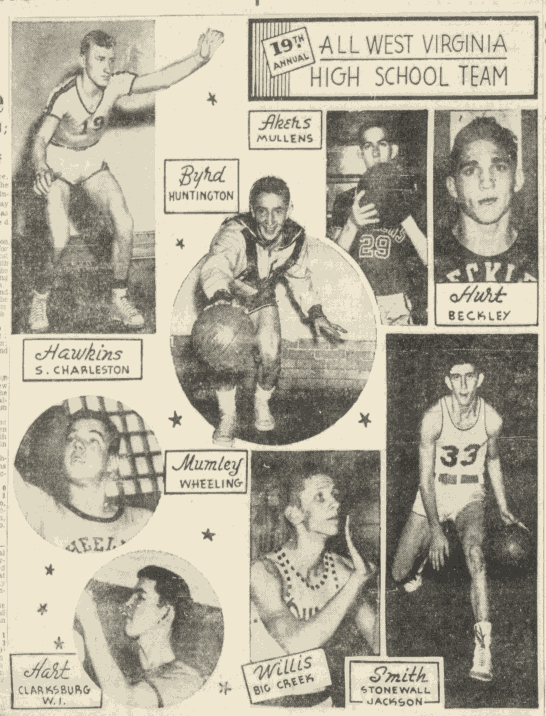 The 1955 West Virginia All-Stars would be called the states’ best ever to battle Kentucky. A player with a record 40 points per game scoring average and five others who averaged over 30. A player who overcame a childhood bout with polio would lead his team on an amazing run in the state tournament with an historic scoring spree. And a junior from East Bank High School would show his first signs of greatness in 1955 and would eventually become one of the greatest in basketball history. 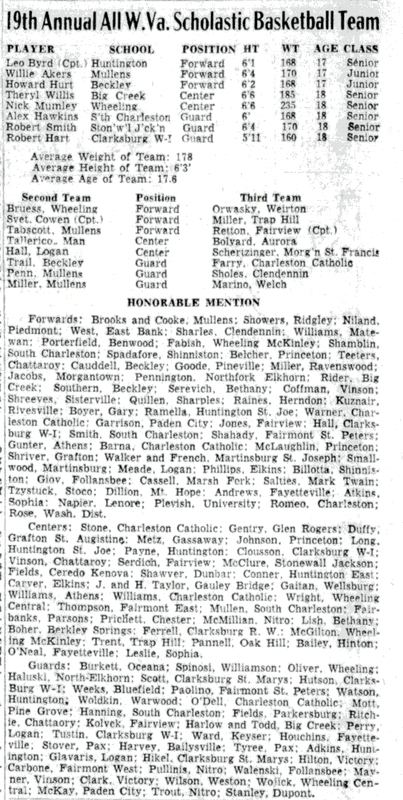 The 19th All-State Team (1955) included First Team: Forwards Leo Byrd of Huntington, Wille Akers of Mullens; Centers Theryl Willis of Big Creek and Nick Humley of Wheeling, and Guards Alex Hawkins of South Charleston, Robert Smith of Stonewall Jackson, Robert Hart of Clarksburg Washington Irving. Special thanks to Josh Hall! If you have a question for Josh or are interested in a copy of the book, email me at stubbycurrence@gmail.com and I’ll make sure to connect you.